Average Weight	: 13-18 lbs. Cavalier Crazy Rescue is dedicated to helping cavaliers in need in Utah. Named for King Charles II, the Cavalier King Charles Spaniel is descended from the King Charles Spaniel. In the late 1600s the King Charles Spaniels were interbred with Pugs, which resulted in a smaller dog with flatter noses, upturned faces, rounded heads and protruding eyes. The consequence of this breeding is what we know today as the King Charles Spaniel (English Toy Spaniel). In the 1920s an American named Roswell Eldridge offered prize money during a Cruft's Dog Show in London to any person exhibiting King Charles Spaniels with long noses. He was looking for dogs similar to those appearing in Van Dyck's paintings of King Charles II and his spaniels, before the Pug was bred in. A dog called Ann's Son, owned by Miss Mostyn Walker, won the Eldridge prize, however Eldridge had died a month before the show opened and was not there to present the award. His ideas lived on in American breeders. 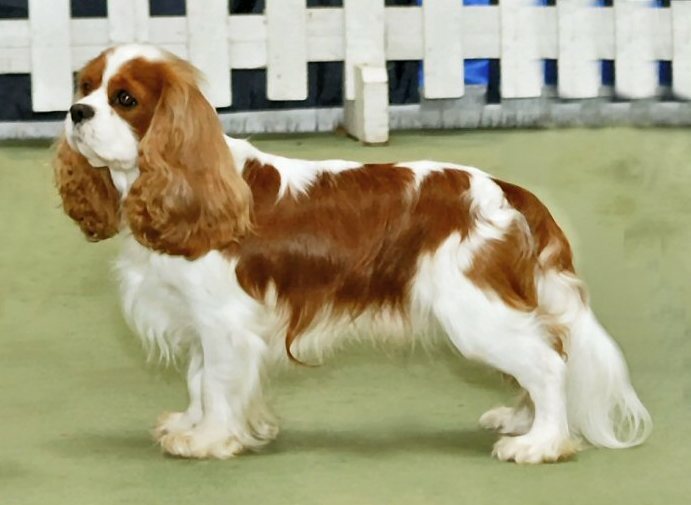 The Cavalier King Charles Spaniel breed, as we know it today, is the product of the American breeders of the late 1920s, though this 'modern' breed is the true heir of the royal spaniels of King Charles II. By the 1940s these dogs were classified as a separate breed and were given the prefix Cavalier to differentiate them from their forebears. The Cavalier King Charles Spaniel has a wonderful temperament and is ideal for single people, couples or even families. They are curious and playful by nature but also enjoy just cuddling up on a favorite cushion or even better on their owners lap. The Cavalier King Charles Spaniel loves interacting with people and really needs a lot of human attention on a regular, ongoing, daily basis. This is not a dog that does well left alone for moderate to long periods of time. They require contact with people on a continuous basis to avoid falling into negative behaviors such as chewing and barking and becoming nervous. Most breeders recommend the Cavalier King Charles Spaniel to families with older children simply because they are so small as puppies they may easily be accidentally injured by younger children. The Cavalier King Charles Spaniel is an excellent companion dog for dogs in the family or even other pets such as cats. They are natural "chasers" so do need proper socialization to understand not to chase the other pets in the house. They do well with other dogs and are not a dog-aggressive breed. Early socialization with other dogs will help the Cavalier King Charles Spaniel from becoming territorial or timid around other dogs. The Cavalier King Charles Spaniel will bark when strangers come to the door and may take a few visits before they warm up to new people. The Cavalier King Charles Spaniel bonds with family members and will often choose a favorite family member although they will get along with everyone. The Cavalier King Charles Spaniel is a dog that enjoys being outdoors and going on walks and outings despite its small size. They are moderately active if left inside and will play and romp through the house or apartment if they can't go outside. The Cavalier King Charles Spaniel is a natural pleaser and is a very easy dog to train and teach. They respond best to positive rewards and attention and love to be the center of attention. As a Toy Breed the Cavalier King Charles Spaniel is remarkably healthy. As an average shedder it is important to keep the Cavalier King Charles Spaniel well groomed on a regular basis. The dead hair, if not removed from the coat, will result in matting and tangling of the fine, silky hairs that make up the Cavalier King Charles Spaniel coat. The Cavalier King Charles Spaniel is a very adaptable breed of dog that can adjust to the level of activity within the home. They do need regular exercise just as any other breed, but they are happy to just walk around the house with the owner or go for a brisk walk or a morning jog. This adaptability towards levels of exercise is what makes this breed such a versatile dog for seniors, families, very active individuals and even people with limited mobility. Since the Cavalier King Charles Spaniel is a dog that will chase it is important to keep them in a fenced yard or on a lead whenever they are out of the house. They are so small they can easily dart out onto a roadway without a driver even noticing, often with tragic results. Early lead training either with a traditional collar or with a harness is the best idea to safeguard the Cavalier King Charles Spaniel when it is outside of the house. As with most toy dogs the Cavalier King Charles Spaniel has a lot of spirit and loves to be involved in everything that the family does. They are great travelers and quickly learn to love going in the car. This makes them easy to exercise as they can go anywhere the family goes for changes in exercise locations. As a spaniel breed the Cavalier King Charles Spaniel will retrieve small balls and chew toys and typically do this very naturally and will little specialized training. Toy breeds, the Cavalier King Charles Spaniel included, should not be encouraged to jump up or down off of furniture as it can lead to kneecap displacement and joint injuries as the dog ages. The Cavalier King Charles Spaniel is a very easy dog to train as it is so eager to please and to earn the owners praise and attention. Since they have been used as a companion dog throughout history they are naturally very responsive and well mannered, although like all dogs, they do need to be carefully, positively and consistently trained. Like most toy breeds they can be challenging to housetrain since they are so tiny as puppies. Carefully monitoring the Cavalier King Charles Spaniel and taking them outdoors after eating, drinking, waking or playing will greatly help this process. They are naturally clean dogs and will also respond very well to crate training as a housetraining method. Socialization is a key consideration in the Cavalier King Charles Spaniels development. A puppy obedience class is a great way to combine both socialization as well as basic instructions. Often smaller breeds have a tendency to both jump and bark, so it is essential to control both these behaviors right from the start and teach the Cavalier King Charles Spaniel to sit for attention as well as bark once or twice and then stop. Positive reinforcement through praise and attention as well as a simple "no" and ignoring for a few minutes is usually all that is required to help the puppy understand what is acceptable and what is not. Training the Cavalier King Charles Spaniel on a lead is also important. Many people choose to use a harness instead of a traditional collar, as it is easier on the throat area of a small breed, especially if they have a tendency to pull against the collar. An obedience class can help correct this if it is a problem.